Crayons, originally uploaded by dcbprime. A crayon is a stick of wax, clay and usually with a coloured pigment. It is for drawing, colouring, writing or even for illustration. For younger children below 5 years, this is a popular material for allowing the children to express themselves in art forms as they are not messy compared to paints and markers. They are blunt thus removing the risk and danger of sharp points compared to a pen or pencil. 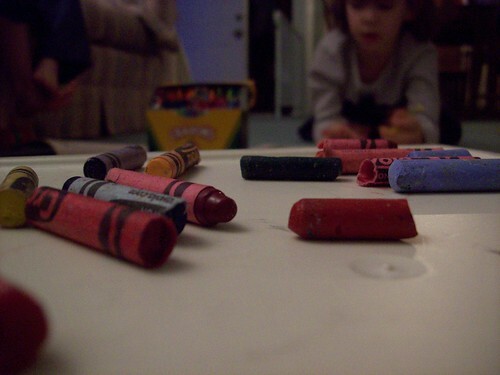 Most of all, crayons are non-toxic, inexpensive and available in many colours. Those crayons made with oiled chalk is called 'oil pastel'. Pastel are made with a dry binder. Nowadays, there are water-soluble crayons.